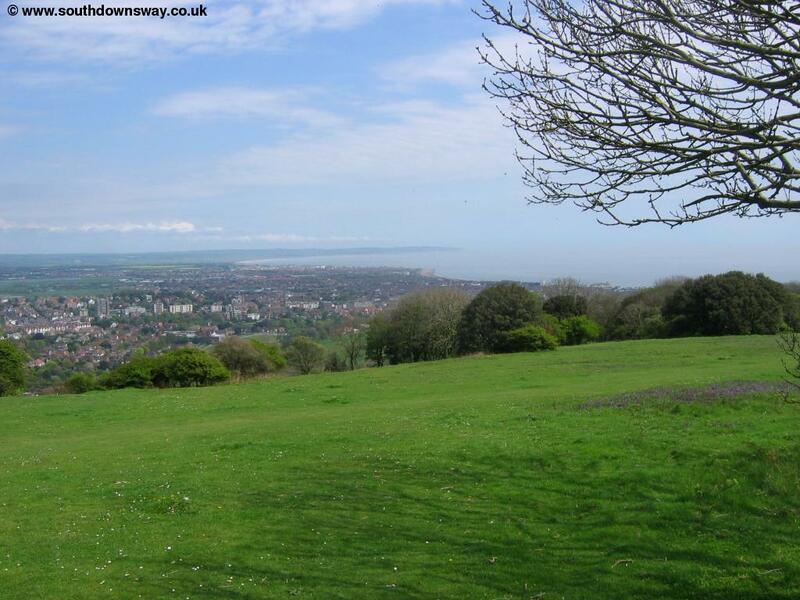 Eastbourne is on the A22 (London to Eastbourne road). 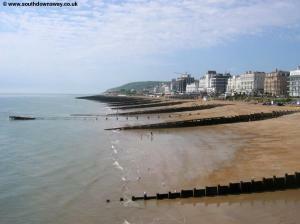 The A27 and A259 roads also go to Eastbourne from the coastal towns in either direction. 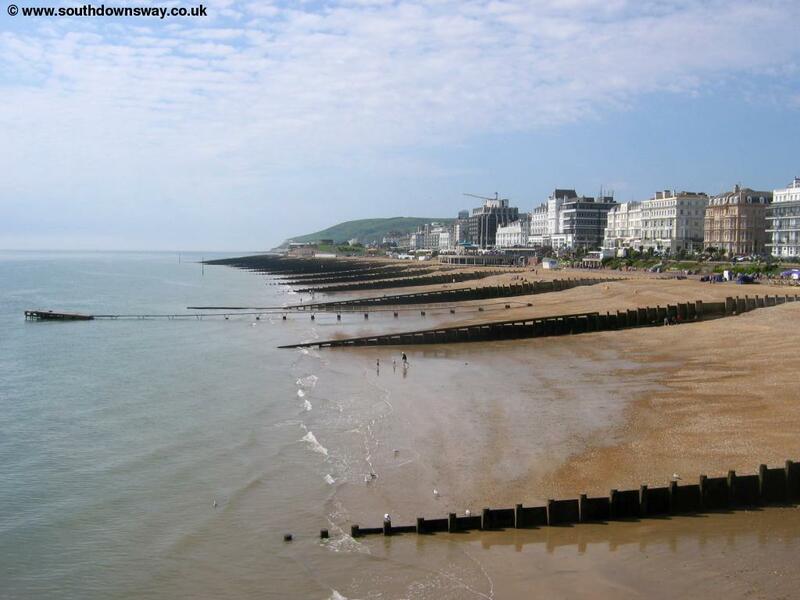 Parking in Eastbourne is available at the sea front or at several large car parks a little inland (though avoid the one at the Arndale Centre as it's expensive). 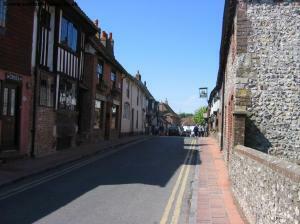 There is also some on-street spaces around the town centre though most are not long-stay. At very busy times (for example summer weekends or bank holidays) it might be worth parking at Polegate station which is just off the A27 and A22 to the north of the town. 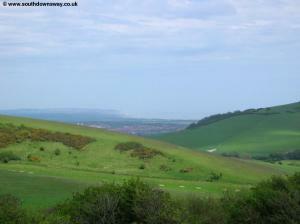 Here there is a large car park with frequent trains to Eastbourne. 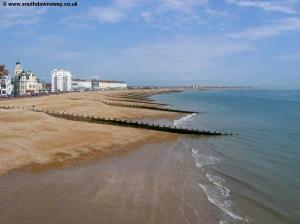 If you're travelling by public transport there is a station in Eastbourne. Eastbourne has frequent trains (generally 2 per hour Monday-Saturday and hourly on Sunday) from London (Victoria), East Croyden, London Gatwick Airport, Haywards Heath, Lewes and Hastings as well as local coastal services from Hastings and Brighton, all operated by Southern. There is also a frequent local bus service to Exceat, Seaford, Newhaven, Peacehaven, Rottingdean and Brighton operated by Brighton and Hove which runs generally at least every 20 minutes seven days a week. 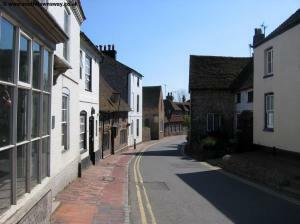 Other bus services run to Tunbridge Wells and Uckfield. 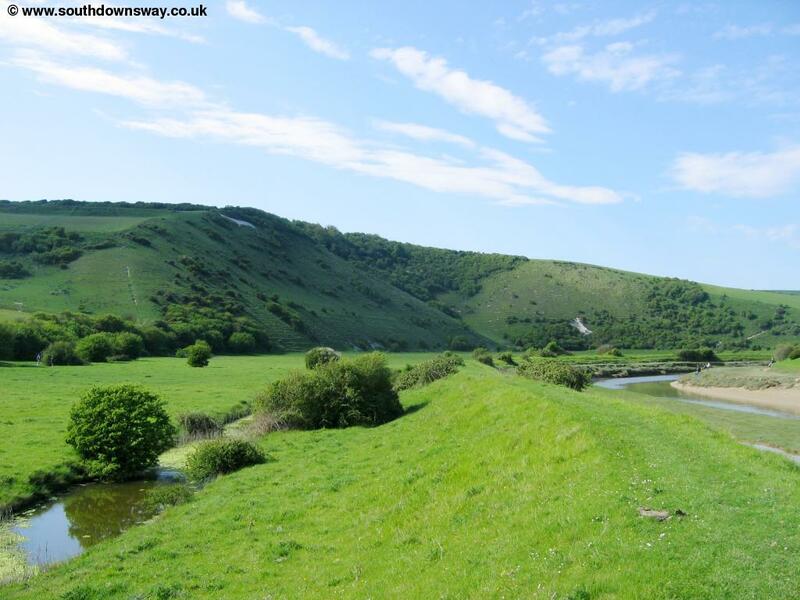 The town of Eastbourne is the eastern end of the South Downs Way, but the path actually runs in a loop between Exceat and Eastbourne with an inland path, via Alfriston, and a path along the coast via Birling Gap. 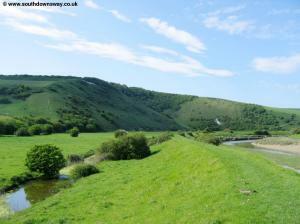 This walk completes this loop by following the inland route via Alfriston. 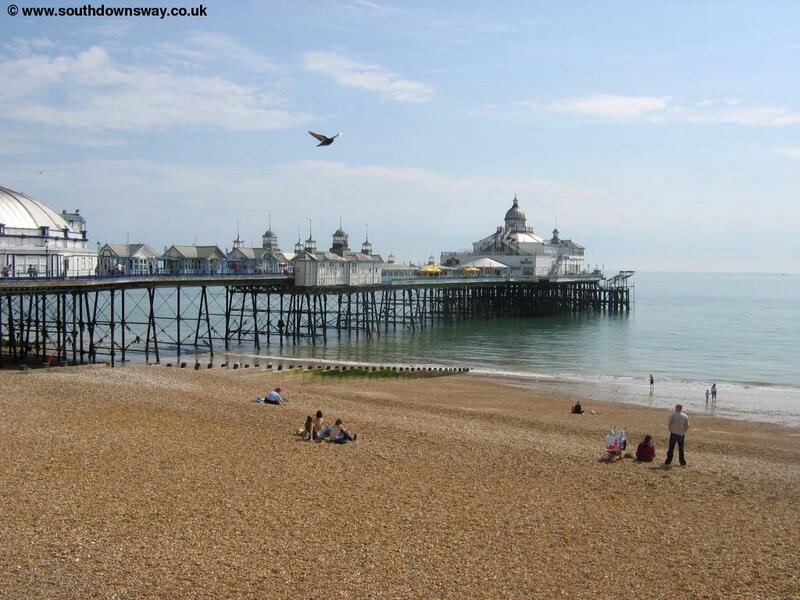 Starting from Eastbourne pier follow the sea front until just before you get to the Martello Tower on the sea front, then turn right into Carlisle Road. 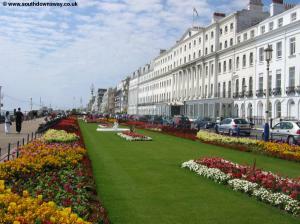 Continue down Carlisle Road away from the sea front. Keep on this road as it climbs to the edge of the town. 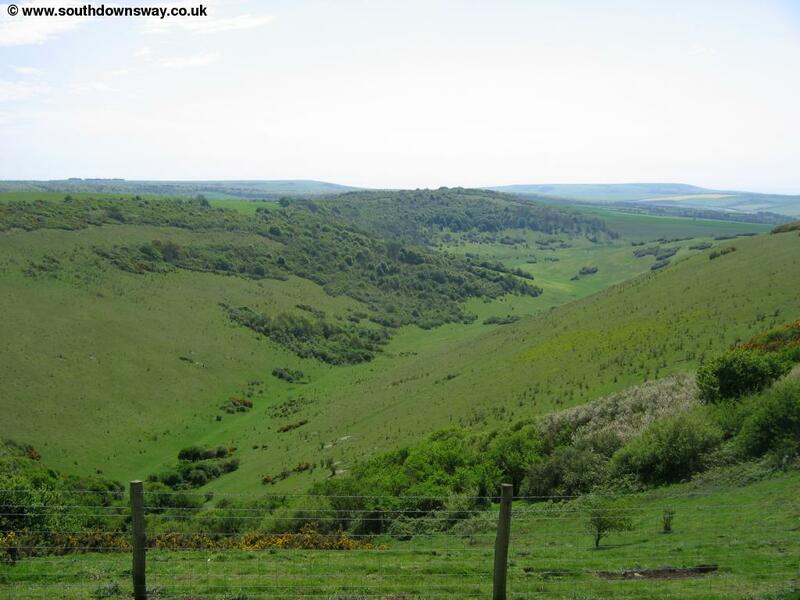 Soon you come to a sign for the South Downs Way at the junction with Paradise Road. 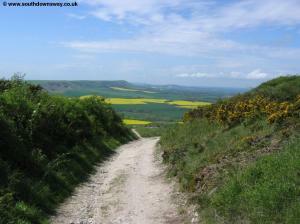 Here the path climbs up back onto the downs. 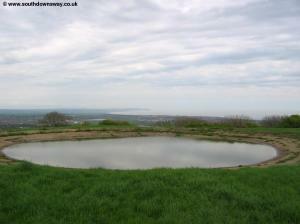 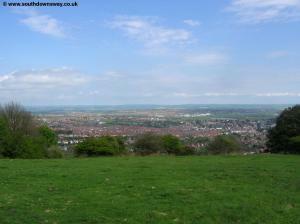 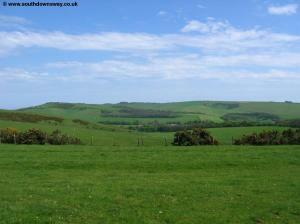 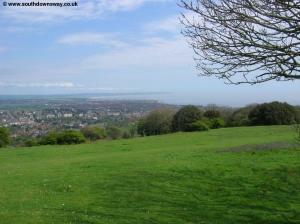 From here you have excellent views over the town and beyond to Pevensey Bay, Normans Bay and Bexhill. 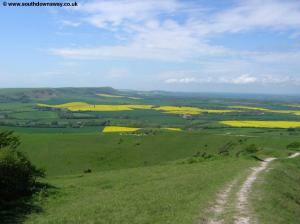 Continue following the obvious path over the downs as it turns to the right. 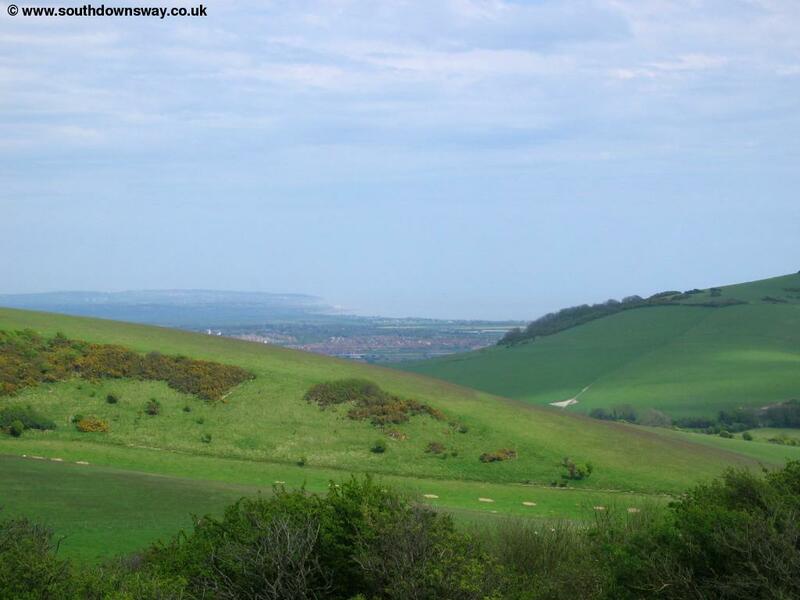 Soon you get to the n A259 road which you cross and continue straight on, now passing across the Eastbourne Downs Golf Club with continuing views over the town. 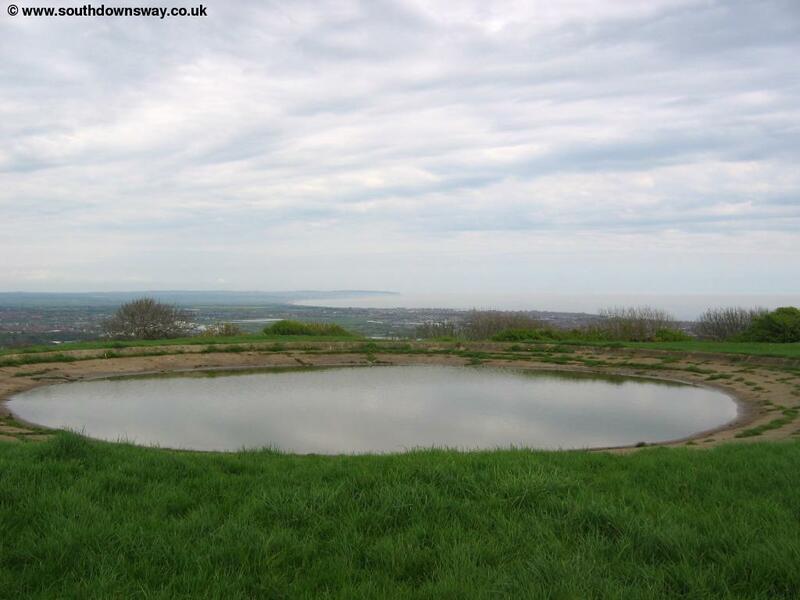 Soon trees begin to get closer to the path and you pass a pond on the right. Soon you come to a junction of paths, with the Wealdway turning off to the right. 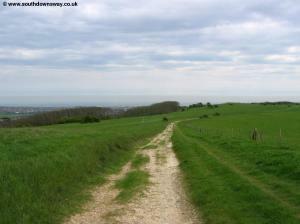 The Wealdway is a long distance path from Gravesend in Kent on the Thames estuary down to Eastbourne. 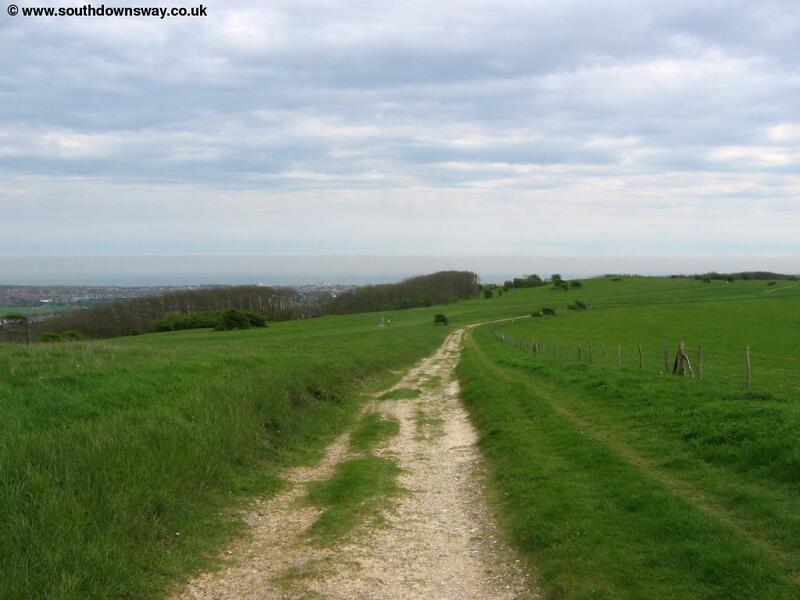 The 1066 Country Walk is a path from Rye to Pevensey with connecting paths to Hastings and Bexhill and also (apparently) to Eastbourne. 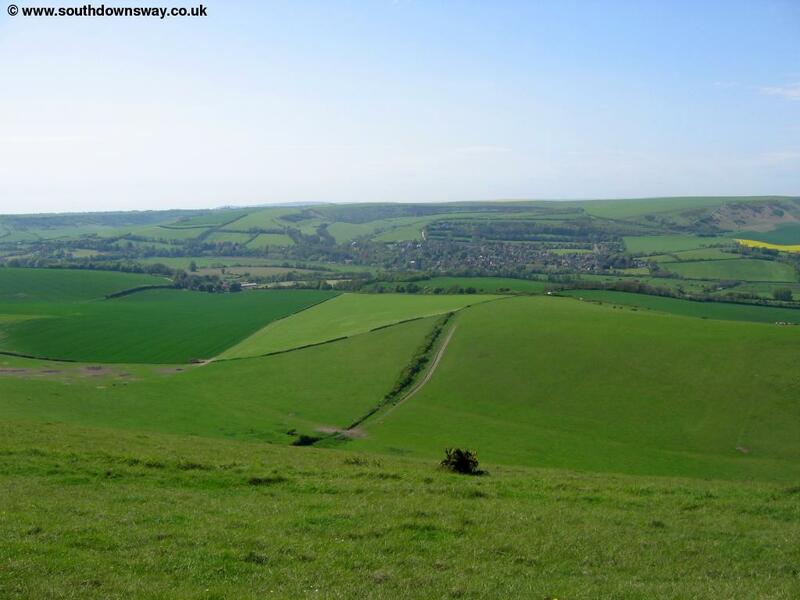 At this junction of paths the South Downs Way continues straight on and here you have views to the village of Jevington below. 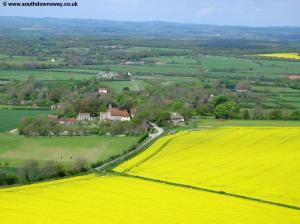 Follow the path as it descends to this pleasant village at the bottom of the hill. 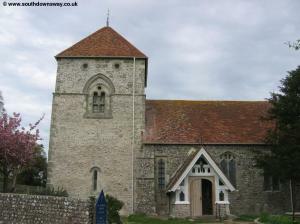 The village is very old with the church thought to date from around 900AD. 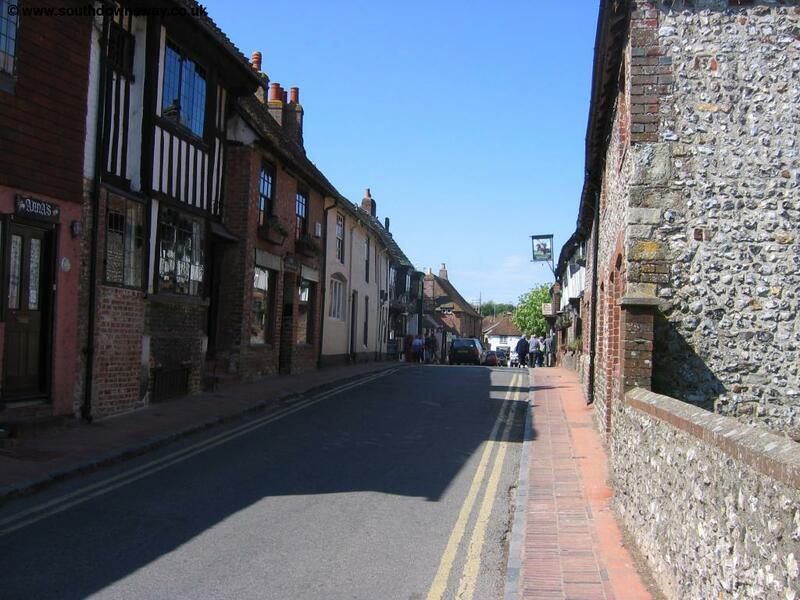 As you come into the village in Eastbourne Road turn right onto Jevington Road then left up Church Lane passing next to the church. 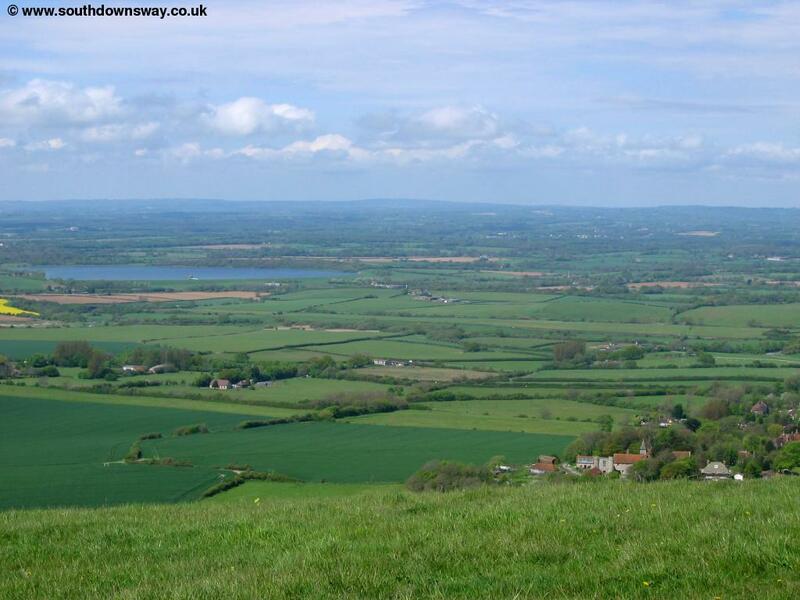 The path then climbs away from the village passing through a small group of trees before you come out to a stunning view, particularly to the north, over the fields to the north, Arlington Reservoir and beyond to the North Downs. 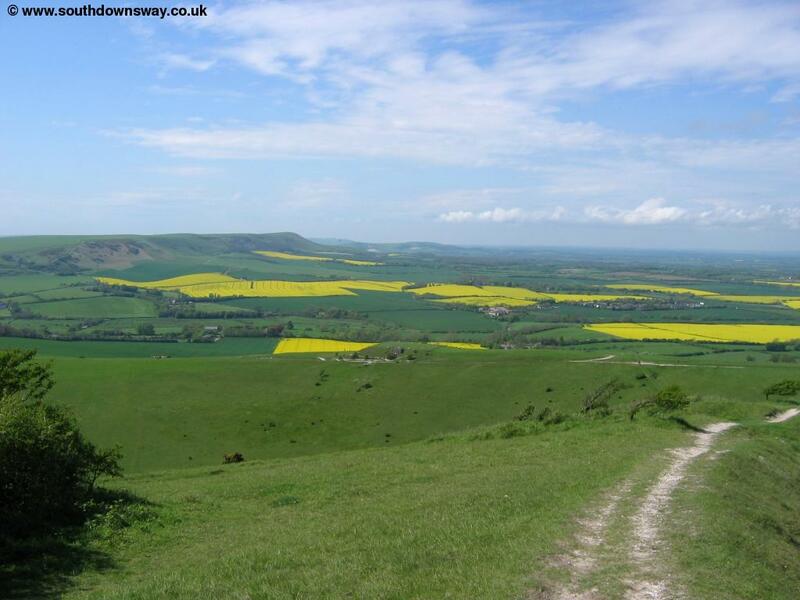 The path now follows the top of the downs overlooking the beautiful valley to the left, Deep Dean, reminding me of Ditchling Beacon further west. 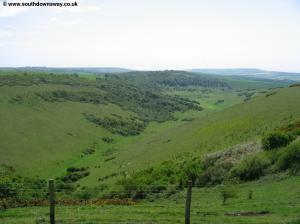 This whole valley has now been opened up as part of the Countryside and Rights of Way act. 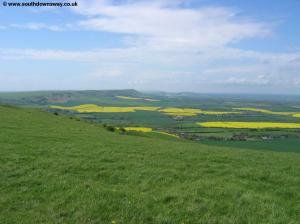 and is now access land. 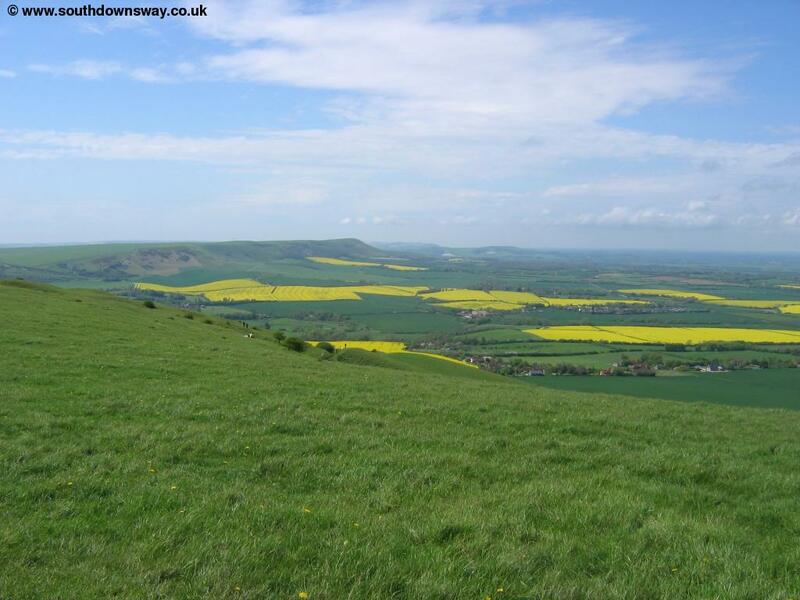 The path climbs to the top of the hill behind the valley before turning to the left and slowly descending. 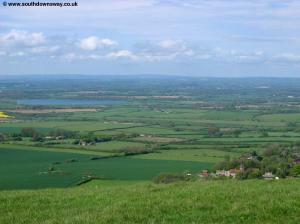 Perhaps surprisingly you pass a reservoir on the right, where the ugly building is. 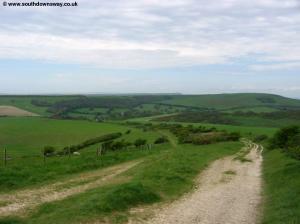 Soon you come to a small road which you cross and continue straight on as the path descends down to Alfriston below. Soon you come to another road where you turn left into Alfriston Village. 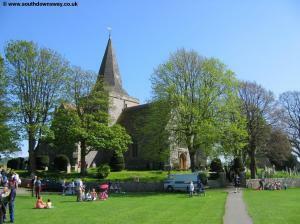 The village has a large church and village green as well as many pretty buildings so is worth stopping to take a look. 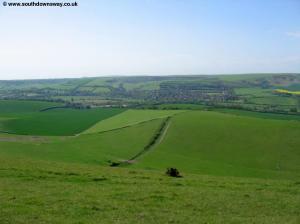 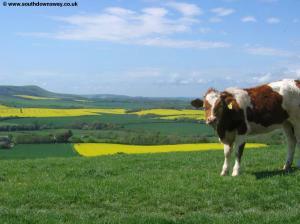 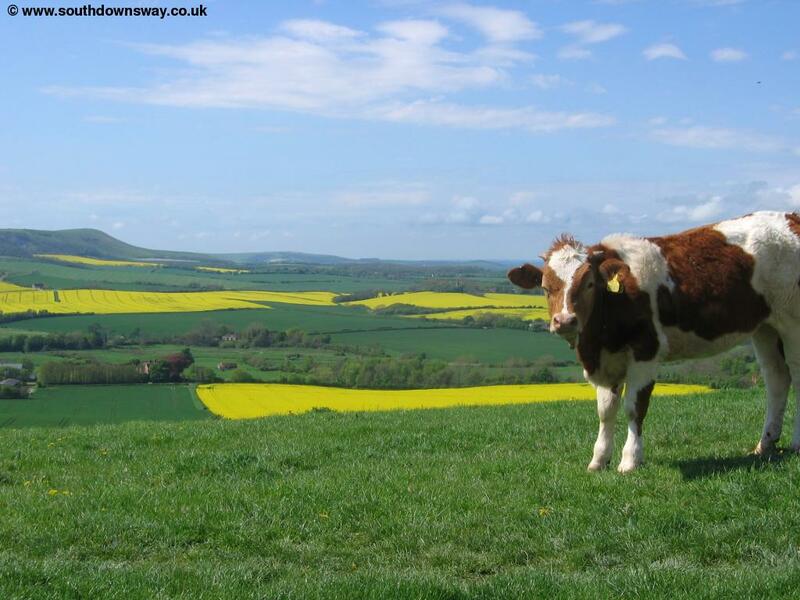 Here the South Downs Way divides with one part continuing west whilst the other part goes south towards Exceat. At the junction of the South Downs Way just by the white bridge over the river the South Downs Way turns left to head towards the coast. 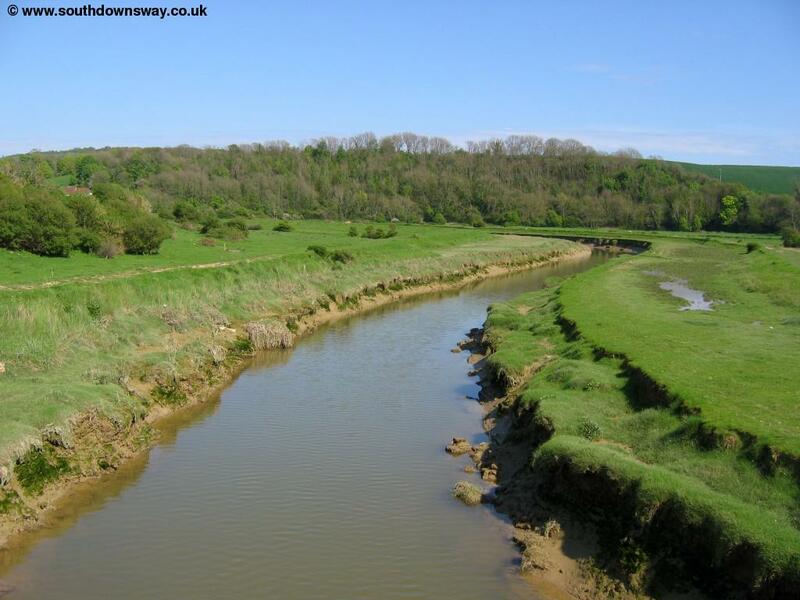 However having walked this part of the path before I decided to cross and follow the path on the opposite side of the bank - both take you to Exceat bridge. 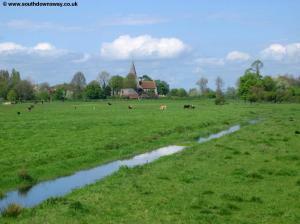 As you head south away from Alfriston look back for a lovely view of the church across the water meadows. 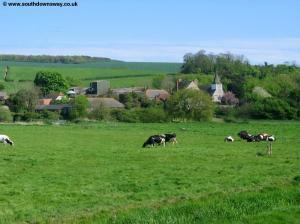 Soon to your left you can see the village of Litlington with it's church tower especially visible. Continue south following this beautiful and undeveloped river valley where you may well see a heron. 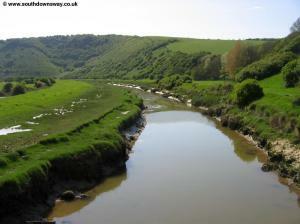 Soon the river turns towards a large hill which it rounds the bottom of, known as High and Over. 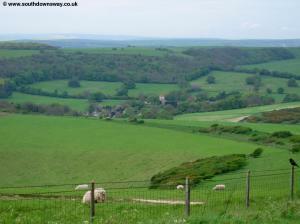 On the side of the hill is a White Horse cut into the chalk, dating from the mid 1920s. The path rounds the bottom of this steep hill (which is also now access land) and continues to head south. 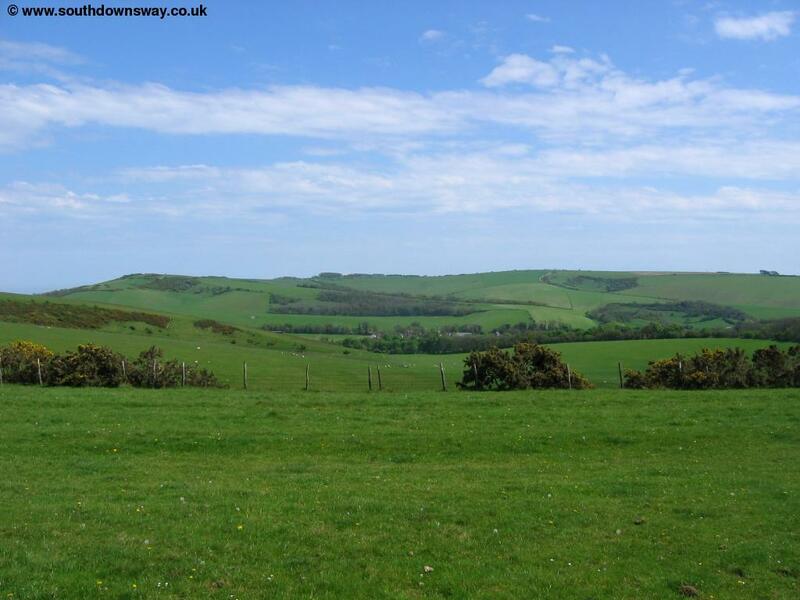 The path south of these hills can become very muddy and does not seem to be especially well defined, although there are stiles across the fences. Soon you can see the bridge ahead and pub beyond. 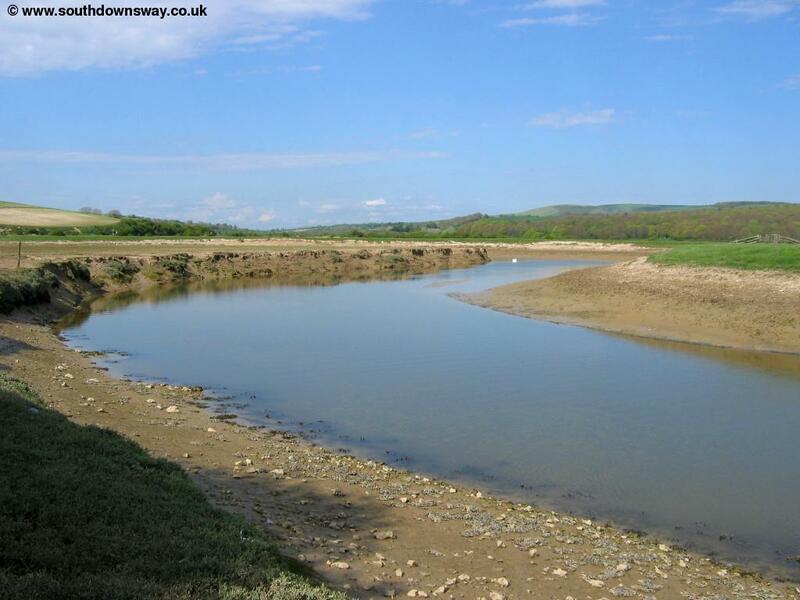 Just before you come to the main road you have to leave the river bank to follow the road down to Exceat bridge itself, the end of this walk. If you wish to continue the path continues south to the beach at Cuckmere Haven. At Exceat there are frequent buses seven days a week (typically 4 buses per hour Monday - Saturday and 3 per hour on Sundays). 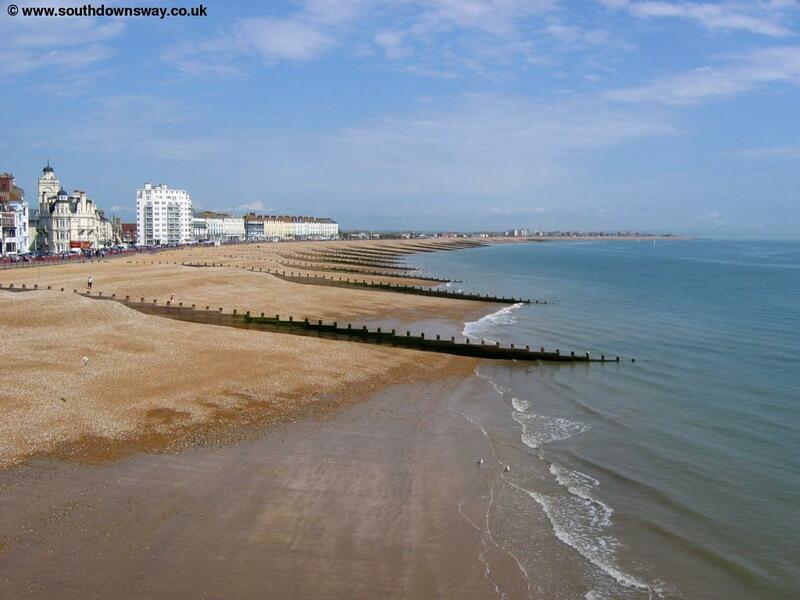 On Monday - Saturday all buses are route 12 operated by Brighton and Hove and Stagecoach running via East Dean. 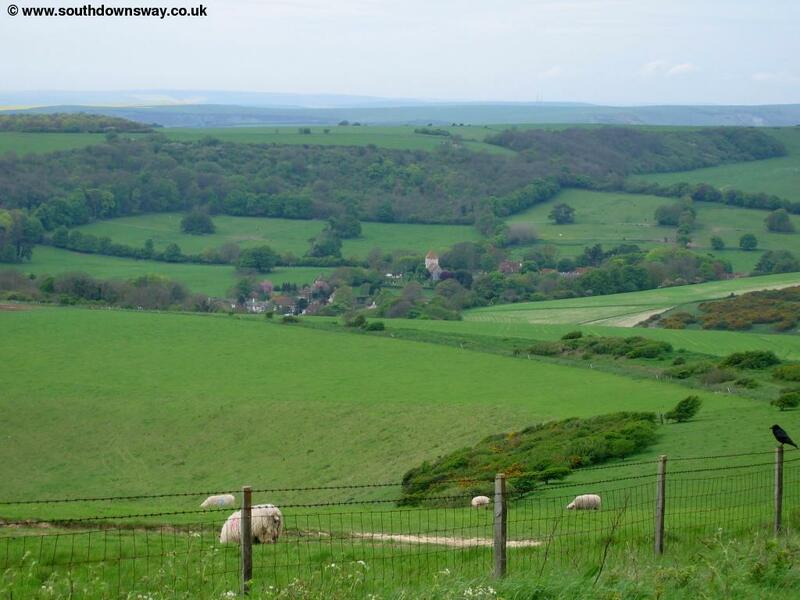 On Sundays some of the buses run as route 13 rather than 12 and go via Birling Gap and Beachy Head and as most of these buses are double-deck buses they provide superb views around the coast. The buses pass the rail station in Eastbourne, (for trains to Hastings, Lewes, Haywards Heath, Gatwick Airport, Brighton and London and various other places), the Arndale Centre and the pier.